A musical romance that honours and updates the Hollywood classics. 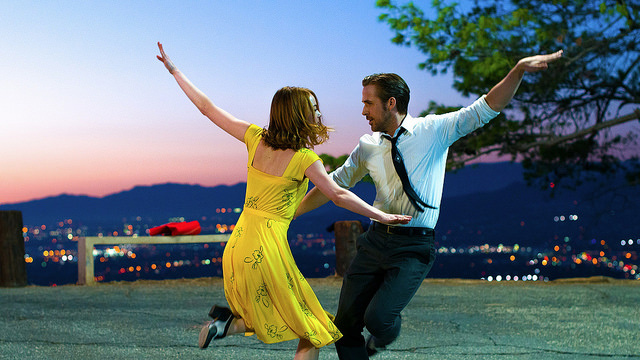 With Emma Stone and Ryan Gosling, this modern masterpiece is filled with choreographed musical numbers and a love for performance. A Monster Calls is a film based on Patrick Ness’ novel; it is an emotional and fantastic tale for all ages. See review. Big blockbuster movies screened on campus every week. Coming up: Fantastic Beasts and Where to Find Them (week 12) and Arrival (week 13). The Folk Society holds their regular dance session. Everyone is welcome with no experience necessary to come and join in and have fun. The University of Cumbria’s final-year degree theatre students present Mojo, a debut play from the author of a West End and Broadway Show, Jerusalem. A comedy performance set in the gangster world of the 1950s. An emotional film drama from acclaimed writer-director Kenneth Lonergan, featuring a wonderful performance from Casey Affleck. Elf Lyons (Feminist Times’ One to Watch), an award-winning, comedian from London, explores the fear of turning into your mother and what it means to have it all, in her new comedy performance. A film that takes a haunting look at the private and public life of Jackie Kennedy (played by Natalie Portman) in the aftermath of the 1963 assassination of her husband, President John F. Kennedy. The Pretend Men’s multi award-winning and critically-acclaimed parody ‘Police Cops’ is an action-packed hour of physical comedy on stage. Ben Affleck returns to direct a compelling action-packed thriller about cops and gangsters in 1920s and 30s America.